An inbound marketing agency or growth agency is an organisation that helps businesses attract new customers. In 2017 that usually involves using the web. For clarity, inbound marketing is a process whereby you attract visitors to your website who are looking for what you offer. You do this in the hope they will contact you, or at least learn something useful so they feel positively disposed towards your business and contact you in the future. Our last blog, Shall We Dance, suggested a better way of developing a new website by hiring an inbound or growth agency to carry out a road mapping exercise prior to the main project. The suggested approach applies to most web development projects but specifically when creating a lead generation website, a site built to attract traffic from Google™ resulting in qualified or at least part qualified enquiries. To start this process you need to have some conversations with suitable inbound agencies, which begs the question, how do you choose an agency to help you with projects like this? First of all, creating a website that generates qualified leads is hard work, a real slog. Don't let anyone tell you any different unless you're in a specialist niche, have few competitors and hardly any websites offer what you plan to offer. This is rare. For most businesses competition is tough, their marketplace is noisy and getting found by prospective customers in Google and the other search engines is hard. This means you're looking for an agency to be your partner, not a vendor. A vendor will usually only do what you ask them and unless you've got some in-house expertise to figure out what they need to do, that's not going to be a good use of your money. A partner, on the other hand, will do a deep dive into your business and establish what it's going to take to get you from where you are, to where you want to be. A partner will have skin in the game because their success depends on yours. If you were choosing someone with whom to undertake an expedition, you'd most likely want them to be capable and companionable. If they were capable but you didn't like them it might work, but there would be challenges. Equally, if you liked them but they were useless, that's not going to be great for either of you. Chemistry is a funny thing. On paper, someone might be your kind of person, but when you meet them something doesn't gel. This is something you're going to have to figure out yourself, but it shouldn't be difficult. Where you might struggle, is finding a capable agency. Setting aside the chemistry, there's one very easy way to establish if the inbound or growth marketing agency you're thinking of talking to practice what they preach. You see, many agencies have jumped onto the inbound bandwagon because they understand web technology, not because they understand inbound and certainly not because they are using inbound for their own businesses. If you buy into the idea that the best agencies to help you leverage inbound for your business are agencies who have leveraged inbound for themselves, here's a great way to check them out. There's a fantastic tool called SEMRush. If you punch a domain name into it, it gives you a load of great information, including how much traffic the domain's website gets from Google, the search terms the website ranks for and how much it would cost to buy the traffic the site gets from organic search using paid search. Now, that last bit might be a little confusing, the whole cost of paid search using an organic search equivalent. I'll clear that up now. A typical search result in Google might look like this. I searched for car insurance. The first four results are paid search results and those sites pay a fee to Google if someone clicks these links, that's why they are called Pay Per Click of PPC results, note the little green box with the word Ad inside it. The next two are organic results, they are number 1 and number 2 in the organic rankings because they deserve to be there as judged by Google's algorithm. What SEMRush rather cleverly does is provide an amount of money it estimates a domain gets from free organic search expressed as the amount it would cost to buy that traffic using paid search or PPC. For example, here's what GoCompare looks like, the first site in the organic rankings in the example above. 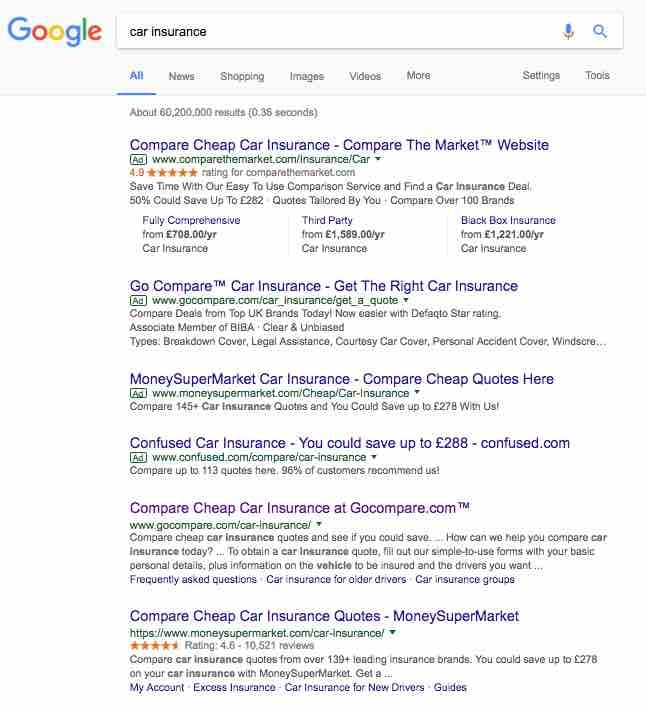 In this example, you can see it would cost £8.3M to buy GoCompare's organic traffic using PPC equivalent. That's per month. They are nailing it. To check the agencies you're thinking of working with, simply go to SEMRush, enter their domain name and see what sort of traffic they get. If they are trying to suggest inbound is the way forward yet they don't appear to be using it themselves, ask them why not. If they're doing inbound for themselves and they're good at it, you should expect to see their SEMRush Traffic Cost into the 1000's of £'s or $'s. You should also expect to see them have keyword rankings for several hundred search terms. If this isn't the case, dig a little deeper. Is That Really A Good Measure? An agency with poor SEMRush results might argue these metrics are not a good indicator of capability. I fully accept some good agencies might have poor rankings for their own website whilst securing great results for their clients. However, this tool does provide at least some guidance on whether or not an agency practice what they preach, and if they don't, why don't they? It might be because they are busy doing great work for their clients. It might be because they are new and working hard on their own rankings whilst working for clients or it might mean they've simply jumped on the bandwagon. That's for you to decide, but at least with this, you've got something concrete to go on.